The HX300 is a decent superzoom with plenty of features on offer. It performs well and has a stonkin' great zoom lens, but it's the resulting images which lack the finery we'd have hoped for - but no surprise given the high-resolution sensor. A good all-rounder. Superzoom cameras across various brands have been crafting out their own individual points of interest of late. Sony's angle, it would seem, is all about resolution: the Cyber-shot HX300 pairs a brand new 50x optical zoom lens - capable of a 24-1200mm equivalent - with a new 20.4-megapixel CMOS sensor. Its competitors, on the other hand, have opted for different tactics: the Canon PowerShot SX50 HS has a more conservative 12.1-megapixel resolution and a similar lens, while the Panasonic FZ200 doesn't have the same reach from its 25x optical zoom lens but does maintain a maximum f/2.8 aperture through its full 24-600mm equivalent range. We've been fans of the Sony HX-series over its last few iterations, but is the Sony Cyber-shot HX300's push in resolution more of a hindrance than a benefit to this latest bridge model, or does it elevate the series to new heights? The HX300's new lens is a serious bit of kit. With a 50x optical zoom measuring up to a 24-1200mm equivalent - the same focal length as per the Canon SX50 HS - there's little that won't be in range from this superzoom. It's considerable compared to its HX200V predecessor, but - and as we found with the similar Canon SX50 - doesn't throw those numbers in there for the heck of it. Nope, even at the 1200mm equivalent and thanks to a decent optical image stabilisation system the Sony HX300 is more than capable of delivering the goods. The HX300's widest 24mm equivalent is wider than its predecessor and while numerically it may not be by much, the difference between 27mm and 24mm is considerable in practice. Of course at such a wide-angle and paired with the ability to stretch to such long distances the HX300's lens is a big ask. As such it's a series of compromises as much as it is the amalgamation of engineering excellence: don't expect aberration-free shots at the wide angle, nor is the lens the crispest at its longer focal lengths. But then that's to be expected - the same lens on a DSLR would be considerably larger and infinitely more expensive, which is the main benefit of this all-in-one package. The Sony HX300's maximum aperture range starts at a bright f/2.8 at its widest-angle setting and settles down to f/6.3 at the longest 1200mm setting. This is important because it means less light can enter the camera as the zoom extends and so, depending on lighting conditions, the camera will often need to use digital amplification - ie, push the ISO sensitivity - to get the desired results, and that comes at the cost of image quality. In really bright conditions it won't be too much of a bother, but we found the HX300 is programmed to opt for slower shutter speeds rather than pushing the ISO sensitivity - and that can cost shots from being at their sharpest at longer focal lengths. Still, all things considered, this all-in-one lens package is up there with the likes of the Canon SX50 HS which is no bad thing at all. One of the design decisions that we're particularly pleased with is the inclusion of a large manual zoom ring that can double up as a manual focus ring via the flick of a switch on the lens barrel. The analogue motion of the ring is converted into digital signals - so don't expect the same proper manual zoom as per the Fujifilm HS50 EXR, for example - for smooth control mechanics. Despite the new zoom implementation, Sony's stuck to its guns with the HX300's design: this is close to a carbon copy of its predecessors, at least in terms of button layout. On the rear that means there's a 3-inch, 920k-dot tilt-angle LCD screen, above which is a 201k-dot electronic viewfinder. We'd like to have seen an auto eye-sensor for the viewfinder's activation as it depends on the press of a "Finder/LCD" button to jump between the two. The electronic viewfinder - which Sony UK's website falsely lists as an "optical" one in its full specification list - isn't huge to the eye, but it's big enough and we found ourselves using it a lot, particularly at those longer focal lengths. As we've already mentioned, the HX300's manual zoom lens is one way to control the focal length, but like most normal compacts there's the second option of a zoom toggle around the shutter button - the choice is yours, or use the two in combination. When shooting in any of the manual modes the rear thumbwheel doubles up as a button and it's this which can be pressed to toggle between ISO, shutter, aperture and exposure compensation values. Toggling between four options - dependent on shooting mode - can be a bit longer than we'd like, and yet the inclusion of all the key components at such short notice certainly has its benefits too. Just behind the shutter button there are two dedicated quick-access buttons - one for focus type, the other to act as a customisable function button. The focus button merely accesses the focus type, manual placement of the focus around around the screen is controlled by a central press of the d-pad in combination with the directional buttons. The layout doesn't feel typical of its competitors, but a short bit of use and the HX300 feels natural to use. It's also comfortable to hold in the hand or against the eye and everything is within sensible reach. We're less keen on the full menu system's icon-based options which aren't always immediately obvious, but it's rare you'll be digging around in here. Performance-wise the HX300 feels much like its HX200V predecessor - which is good news. Autofocus area controls are made up of multi, centre point, or flexible spot and each is quick throughout the majority of the zoom range. We opted to use the flexible shot for almost all of our work as it gives that user-defined edge for heightened accuracy - the focus area doesn't extend to the outermost areas of the screen, but the bulk of where you'll want to focus up is covered. Few qualms to raise here. Close-up focus also works well and, despite there being no specified "macro" mode on the d-pad or within the menu setting, we were able to capture subjects that were almost touching the front lens glass when at the widest-angle setting. Good show. And so it falls to image quality to really build on the HX300's successes and elevate it yet further. But here's the part where the elevator gets stuck a few floors up. It's not that the HX300's images are bad by any means - they're really not - but they just lack that clean and clear quality throughout. Even ISO 80 JPEG images are riddled with processing artefacts which reveal themselves as grain-like structures, while subject edges are smeared rather than crisp and the relics of chromatic aberrations - those coloured fringes that lapse over subject edges - are also visible. More megapixels spread across the same 1/2.3in sensor surface means that light is spread more thinly, which can produce a poorer signal and, therefore, poorer image quality. Why Sony's opted to continue increasing resolution from HX100V to HX200V and now HX300 is questionable. High numbers do sell, but for us they tend to set alarm bells ringing. The HX300's full ISO 80-3200 range does do a grand job of processing out much of the visible image noise, however, including at the higher ISO settings. There is a bit of a slide into softer, more noisy shots above ISO 400, but much of the range remains usable. Exposure-wise we found there was a tendency to err on the side of overexposure, sometimes quite considerably irrelevant of the metering option selected. A series of shots of giraffes at London Zoo needed to be dipped by a full stop to maintain much of the detail - and as there's no raw file capture available if we hadn't done so on site then the shots wouldn't have been particularly usable. Like its predecessor the HX300 does also include detailed in-camera controls for sharpness, colour saturation, contrast and noise reduction to tweak your shots. These can only be set up in advance of shooting, so it's a case of trial and error in set-up - but we still doff our hats to Sony for making such options available in such a camera. We've said it before and we'll say it again: as with any superzoom camera, those looking for a DSLR-beater will need to consider the compromises of an all-in-one bridge camera purchase. Casual users will be pleased by the HX300's considerable range - and we were really pleased with plenty of the shots that we managed to snap - but those looking to use full resolution files for critical detail will find the 20.4-megapixel count isn't particularly advantageous, particularly when considered side by side with the class-leading Canon PowerShot SX50 HS. The Sony Cyber-shot HX300 is a quality superzoom camera from a use and performance point of view, but its high-resolution image sensor drops the ball when it comes to image quality finery. We've achieved some cracking shots using the camera - and that considerable 50x zoom with optical stabilisation is a great enabler - but close-up inspection reveals a variety of imperfections. 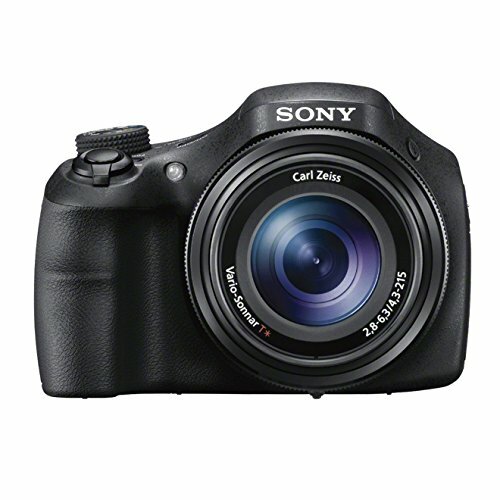 There's plenty on offer here for the £419 asking price and, while not cheap, this is one of only a handful of cameras with such a considerable zoom lens. It's a great all-rounder - we only wish the megapixel obsession would do an about turn and head the other way for the benefit of image quality.